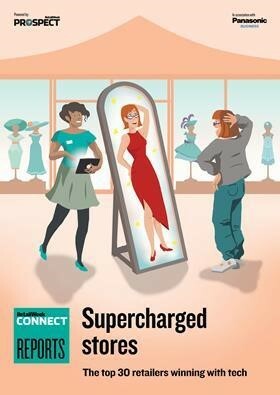 Published today, Supercharged stores: the top 30 retailers winning with tech, produced in association with Panasonic, names Apple as the highest ranking retailer. The top 30, which is dominated by premium retailers, found Apple generated sales of £3,850 per sq ft in 2016/17, up from £3,250 a year earlier. In second place, Burberry generated £2,800 per sq ft in 2017/18, nearly twice as much as Harrods in third position. In an environment where mass store closure programmes are being implemented week in week out, this report uncovers how the best retailers are bucking the trend and driving meaningful ROI from their estates. Both Apple and Burberry use in-store Wi-Fi, mobile point-of-sale (PoS) technology and interactive touchscreens. The rest of the top 30 features a mix of department stores, grocers and fashion groups, which commonly use digital features to improve customer service and convenience. Thirteen of the top 30 offer interactive touchscreens, 12 offer kiosks or terminals in store, while 15 have in-store Wi-Fi. Our report finds that the use of mobile in store is gaining traction as retailers look to merge channels and create a frictionless shopping experience. Mobile can help bricks-and-mortar retailers gather invaluable data to help them provide more personalised experiences. For example, Game uses in-store smartphone scanning features to offer personalised promotions tied to its app, while in Kurt Geiger customers can order out-of-stock products via the retailer’s app and have them delivered to the store. Mobile PoS systems have also been used by the likes of Kurt Geiger, Office and Apple to enable faster checkouts and to free up time for staff to focus on customer service. However, only 11 of the top 30 use transactional tablets for staff in store, suggesting room for further adoption of mobile technology. While these retailers have managed to bring some of the advantages of online to the physical space, there are many more opportunities to transform the in-store journey and convert more sales, particularly around click and collect, location technology and personalisation. The report finds there is a growing demand for radio frequency identification technology (RFID), which enables store staff to locate products on the shop’s shelves and in stockrooms. Tesco, Asda and Burberry have deployed RFID tags to improve stock visibility and support a more frictionless customer journey, and Kurt Geiger is soon to join their ranks. This also has implications for pricing, with grocers able to more quickly locate and reduce prices on foods approaching their sell-by date, again supporting convenience and stock management. Read the full report to better understand the types of in-store tech being used by the top retailers in our sales density ranking and the business case for investing in them. Download Supercharged stores: the top 30 retailers winning with tech today.